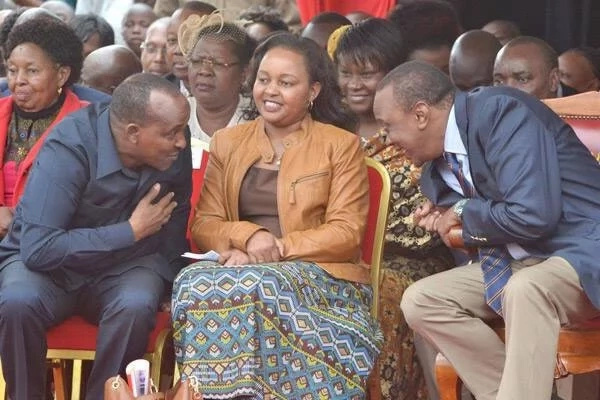 Under pressure Elgeyo-Marakwet Senator Kipchumba Murkomen has claimed that former devolution cabinet secretary Anne Waiguru is intimidating President Uhuru Kenyatta to be cleared from investigations concerning the NYS saga. The senator was speaking on Sunday, February 28 at Chesoi Catholic Church in Elgeyo Marakwet. Murkomen said Waiguru is using coercion and threats to the president and William Ruto by targeting their key allies. The senator claims that Waiguru Waiguru had sent people to his office to demand that the investigations against her be stopped or she would expose him and National Assembly Majority Leader. “Waiguru sent people to me with a message to the president and DP Ruto that the investigations against her should be withdrawn and discussions held to end the inclusion of Duale’s and my name in the NYS saga,” he said. Murkomen also warned the former CS from dividing the Jubilee coalition and also causing diversion the scandal. Anne Waiguru had sworn an explosive affidavit detailing what she knows about the NYS scandal, dragging in highly placed Jubilee politicians including an aide to William Ruto. The tell-all affidavit details how Aden Duale, Murkomen Kipchumba and Farouk Kibet worked behind the scenes to perpetuate blatant looting from the NYS coffers. The three are said to have used their political influence to have payments made to companies associated with them for work not done or done but with inflated costs. In the affidavit its claimed that Kipchumba Murkomen had personally visited Waiguru and told her he represented merchants whose monies were held in the suspended NYS payments. Murkomen went on to tell Anne Waiguru that their bank accounts had been frozen by the Criminal Investigations Department.